Improve the reliability of Li-ion batteries in electric vehicles. Develop a sensing strategy, based on standard available HW in a BMS to monitor relevant signals for the estimation of SoH of a battery during operation. Develop self-learning battery models that accurately monitor the battery state (SoH at module level), using advanced mathematical and statistical methods, based on the sensing strategy above. The DC resistance sensing algorithms developed by ALGOLiON are able to extract several types of innovative parameters that are up to 9x more sensitive to safety hazards than conventional AC impedance and DC internal resistance. The algorithm provides a set of quantitative values for three unique parameters (patent protected) that detect precursors of thermal runaway about a week before they may erupt into fire compared to only seconds with the conventional techniques. The output of the algorithm can be used by the EV BMS to manage counter-measures to prevent safety hazards. 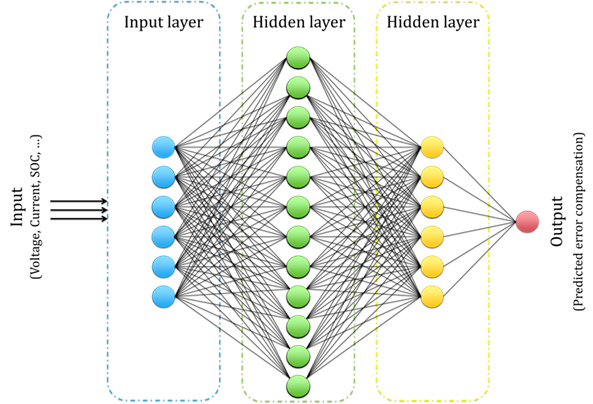 The protocols are useful from the cell level up to large packs and have been validated so far on small packs (both series and parallel configuration). Additionally, the method is suitable for all lithium rechargeable battery chemistries and also over a range of C-rates including high C-rates. A preliminary study has been done by VITO to investigate the use of artificial neural networks (ANN) along with the existing extended Kalman filter (EKF) method for estimating the battery voltage. The ANN model can be used in parallel to the EKF model to independently estimate the error that may result from the EKF model and can hence be used to compensate the same. This approach is tested with actual cell data and the initial results are promising. Different ageing tests were designed to better understand the effect of the battery use conditions on the battery lifetime (VITO and TUV SUD). The ageing tests (life cycling and calendar ageing) are performed on a commercial cylindrical cell similar to the one to be used in the battery pack of the EVERLASTING demonstrator (see WP7). The tests show that the cell performance depends on the environmental temperature, the cycling C-rate and the storage SOCs. The cells will continue cycling at the different temperatures and different C-rates. Real driving profiles (recorded from VOLTIA fleet) was also used to cycle the cells. The results of the ageing tests will be used as inputs for modeling. ALGOLiON’s software will be used in the Project Demonstrator EV.